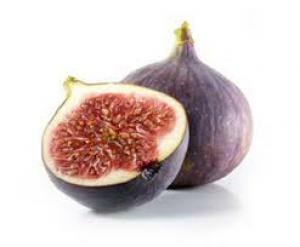 First cultivated in Egypt, about 6000 years ago, figs were Cleopatra's favourite fruit. The fig leaf became the symbol of modesty in the book of Genesis when Adam and Eve first used the leaves to cover their private parts. When figs found their way into Ancient Greece, the Greeks held them in such high esteem they prevented their export: Such is the love we had, and still to this day have, for figs. In some cultures the leaves are eaten, both for culinary and medicinal benefits. Studies have shown that fig leaves have anti-diabetic properties and reduce the amount of insulin required by insulin dependent diabetics. The health benefits of figs are not just restricted to the leaves of this magnificent fruit. Figs are a good source of potassium, a mineral which helps reduce high blood pressure, and are also good for calcium and fibre - for strong bones and digestive health. There's about a two day window when buying figs - all the more reason to buy them from your local greengrocer -, they are extremely perishable and delicate. When ripe they are soft and sweet, with a firm stem, and may even be slightly oozing with sweet syrup. Ripe figs are sweet with the greatest antioxidant potency. Use your nose when buying figs, they should be mild sweet smelling and not sour. Note: Dried figs have high levels of salicylates. Buy fresh figs loose if possible to inspect all around the fruit. Look for plump fruit with the skin intact. the skin should not be wrinkled or oozing. Dried figs should be plump and spongy to touch. Figs are extremely perishable and ideally should be used soon or on the day they're purchased. They can be stored in the refrigerator for 2 to 3 days. Dried figs stored in an airtight glass container will last for up to 1 year or longer. Fresh figs are exquisite as they are, added to salads with goats cheese, or baked in honey. Dried figs are delicious poached or used in baking.